Originally a leper colony, the island is now an Armenian monastery that's home to an incredible manuscript library and eclectic museum. Originally a medieval leper colony, this tiny artificial island within the Venetian Lagoon is now a trove of Armenian cultural treasures. Under persecution by the Ottoman empire, several Armenian Catholic monks fled to Venice in 1715 and received the island San Lazzaro in 1717 from the Venetian Senate. They built a monastery, which houses an abundance of historical, artistic, and religious gems, and has been one of the leading centers for Armenian studies. The Mekhitarist monks who maintain the monastery view its extensive, historical manuscript collection as the crown jewel. 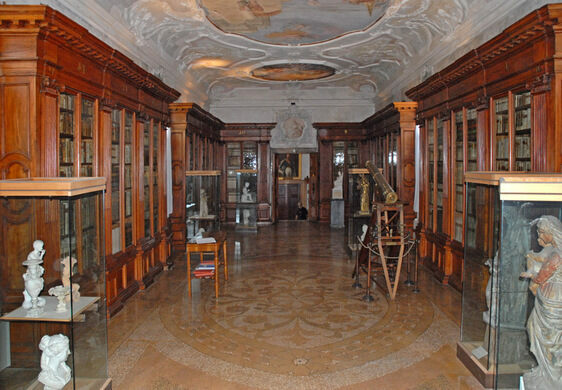 Its manuscript room houses the world’s third largest collection of Armenian publications, as well as other works from Europe and Asia. The wealth of knowledge stored inside the monastery is so impressive that when Napoleon abolished nearly every single monastery in Venice, he allowed the Armenian monks to continue operating it as an academy. Napoleon wasn’t the only notable figure who took an interest in the monastery. Lord Byron, the famous 19th-century English poet, spent a stint on the island studying Armenian culture and language. Today, the “Lord Byron Room” is part of the island’s museum which holds a fascinating mixture of Oriental and Egyptian artifacts, including an intricate ivory ball containing several spheres carved from a single piece of ivory by a Buddhist monk who allegedly spent over 20 years creating the work, as well as the remarkably well-preserved mummy of an Egyptian priest. Another notable resident was Gabriel Aivazovsky, whose younger brother Ivan’s paintings are world-famous. The museum on the island was able to score an Aivazovsky painting thanks to this connection. Ivan also painted the scene of Lord Byron arriving at San Lazzaro degli Armeni, however that work ended up at the National Gallery of Armenia. It has been an important center of Armenian culture in the middle of Venice for centuries, for most of which time there was no independent Armenia. Amazingly, this little island’s press produced the first printed Armenian dictionary, making it only the sixth language in the world to have a complete dictionary printed. It also published the first modern history of Armenia in three volumes, a periodical, and countless other invaluable scholarly texts. The busy monks on the island don’t just churn out books. They’re also known to produce a delicious rose petal jam each May from the roses that bloom on their island. The jam is sold to visitors; however, with 40,000 visitors a year, it sells out quickly. The vaporetto to the island leaves at San Zaccaria, close to Saint Mark's square. There is only one tour a day in the winter, the vaporetto leaves around 3 p.m. It is recommended to check beforehand. The oldest of Venice's plague quarantine stations, designed to keep the medieval city safe from disease. This peaceful gem in upstate New York was chosen as the future home of the 14th Dalai Lama's Library and Museum. This picturesque medieval monastery guards a small trove of historic treasures. Napoleon's childhood home is now open for people to explore the beginnings of France's short general.